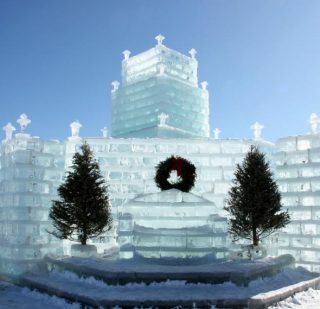 Maplewood Resort provides excellent accommodates for snowmobilers, cross-country skiers, snowshoers,and ice fishermen. We are the perfect headquarters for area winter events such as Eagle River LaBatt Blue USA Adult Pond Hockey Championships, and St. Germain Radar Run / Bikini Run. 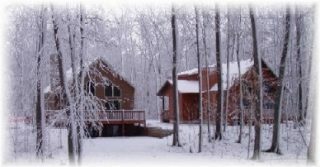 Several lodging choices are available to fit the needs of couples looking for a cozy cabin to large groups looking for a spacious home. Each of our deluxe lakeside vacation homes with fireplaces offers direct access to the snowmobile trail. You can park your vehicle and snowmobile right from your doorstep onto the hundreds of miles of some of the best groomed, well marked trails in the nation’s Snowbelt. We are centrally located near the intersection of the St Germain/ Bo-Boen, Sugar Camp, and Eagle River trail systems on Dam Lake making this an ideal headquarters for your next snowmobile trip. Over the past decade SNOWGOER MAGAZINE readers have ranked the area as the “Best overall snowmobiling destination”. There are several reputable snowmobile rental agents in the area to help outfit you with everything you may need form the snowmobile all the way down to the helmet and boots. If desired, arrangements can be made to have a rental sled dropped off right at your vacation home. Guided tours are also available. Eagle River trail report and more information on snowmobiling in the area. For those who enjoy taking several trips up north for the winter, you may want to consider our long term winter rental options. Homes can be rented for a three or four month period. Leave all your gear, come and go as often as you like. Check out our specials page more info on our long term and midweek deals. There are also over 25 x-country ski & snowshoe trails within our immediate area. Downhill skiing is about an hours drive away. Ice fishing is also a popular pastime. We have also have a gas ice auger available for our guests to use at no additional charge. The area receives abundant snowfall and trails typically open Mid December and remain open through March. We can’t control Mother Nature, and we want you to fully enjoy your time in the Northwood’s. So we have put in place a snow credit policy. If the trails are closed due to lack of snow and you choose not to come your entire deposit will be credited to a future reservation with us. We will honor your credit for one year. Snow credits do not apply to Christmas, New Years, Derby week, or Pond Hockey weekend. We have put together a list of links to help you plan your next winter trip. If you need additional assistance with planning your vacation feel free to call or e-mail us at 1-800-793-8477 or email us at info@maplewood-resort.com.